I did not use bushes or more trees. My first idea was something like Okinawa but it is not VC. Bunkers, tunnels.. So I use real war material to create it - next problem - all hills in this area were without trees. So be patient, It is only one hill. 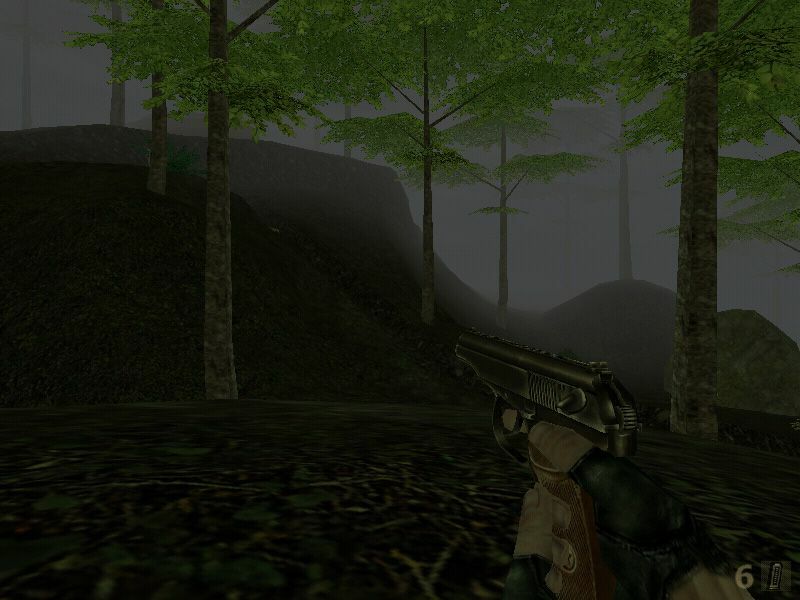 You could also avoid the "flat walls" look at the respawn by using some bushes and trees like I made on my VC_RadioRelay_II map (also at the respawn). I wanted a darker terrain. So I used in addition to lighting also multitexture (image UV 100x100m). I think the result is fine. For some smaller objects of vegetation I have reduced lighting of subobjects. I had a problem with the fact that I had to use more than 6 omnilights. So I created a sector for the cave. I would have to do another 3 sectors for tunnels. so the cave is without lightmaps. Regarding the flat walls around the house. I'm sure I could solve it differently. But I wanted to avoid the problem of your map. I mean that players often can not find the tunnel. Starting in the hut 200m far from the hill is also nonsense. I could have to make a small bare hill with bushes around as insertion zone and one marked path. But the map is already done. Now I'm working on other projects. I will not still coming back to minor details, otherwise I'd had never finish. If you want to fix the map, no problem. I'll give you source files like used scripts. Just do not use same name of map. Thank you for your advice, next time I'll be more thorough. You could slice the terrain before exporting, then not all omnilights affect the whole object. The Problem occurs when more than 8 lights (direct + indirect light and more than 6 Omnis) affect one object. Yes I know and did it. I wanted cave (separate object) in complete darkness illuminated only with omnilights. I had to create sector for a custom ambient, otherwise there would be worldsector ambient light in the cave also without omni. Is a funny map by XHC, try the spectator, its cool to see. I split the terrain to multiple objects, but I exported it as one BES (terrain_xxxxx.bes). I should have to export cave and interiors of bunker as a separate BES objects for better lighting.